Mila is head-over-heels in love with bread. All bread. Garlic bread, cheesy bread, cinnamon rolls, biscuits, buns ... just hand the kid some carbs and we'll all rest better at night. As a result, I've been making some breakfast breads every few weeks. The goal is to interrupt her obsession with waffles with something else made almost entirely out of flour. I mean, why not? This Cinnamon Bread was a solid winner. 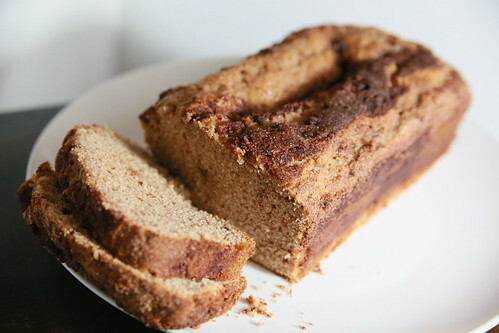 It's similar to Banana Bread, but with a whole lot of cinnamon because sometimes you just have to mix things up. Mila destroyed half the loaf in about 10 minutes, so I guess I'll have to go make more. And more. And more. 1. Preheat the oven to 350°. Butter a 9x5x3" loaf pan and set it aside. 2. In a small bowl, whisk together 1/3 cup sugar and 1 tablespoon cinnamon. Smash in the butter with a fork so that you end up with a lumpy struesel-like topping. Set aside. 3. In a large mixing bowl, whisk together the flour, baking powder, salt, and cinammon. Add the sugar and whisk some more. 4. Add the milk, egg, vegetable oil, and vanilla. Whisk until thoroughly mixed. 5. Pour half of the batter into your loaf pan. Top with about 1/3 of the cinnamon/sugar mix then swirl it gently with a knife to make little cinnamon stripes. 6. Pour in the remainder of the batter and top with the next 1/3 of the cinnamon/sugar mix. Swirl it. Top with the remaining cinnamon/sugar mix. 7. Bake at 350° for 45-50 minutes or until a toothpick comes out clean. Allow to cool for at least 15 minutes then score the edges to remove the bread from the pan. Article originally appeared on burgh baby (http://www.theburghbaby.com/).